Before learning how to cook a turkey, you must purchase one. Most of our supermarkets today carry a nice selection of birds, especially for holiday recipes. They come either fresh or frozen. Some people want a fresh one for cooking Thanksgiving turkey. I have used both and have found no difference. I have never bought a bad turkey until the 2012. When holiday season arrives, family members and friends will offer their own traditional tips on how to cook a turkey to you. If you ask how to cook a turkey, there are several things you must consider. How much does your turkey weigh? Is it stuffed? How much time do you have before serving? 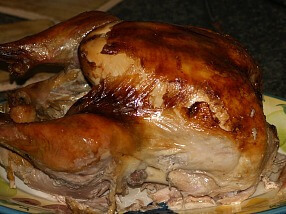 Cooking turkey in convection oven, which many kitchens are equipped with, is different also. You must reduce the temperature or the roasting time will be less. The roasting time will be reduced by 20 to 30 percent. I have been asked about cooking turkey upside down. They claim that the white meat is more moist, but I have not tried it. I don’t find the breast is to dry by cooking it on the back. This might be something too try. Something new has come to my attention lately and I am going to try it. It is called “turduckin”. It is a Cajun recipe and has spread throughout the southeast. First you stuff a chicken with a spicy sausage stuffing. Next you stuff the chicken inside a duck and then you stuff the duck inside a turkey. I am reserving this one for a dinner. It will be a lot of poultry and I will want to get others opinions. 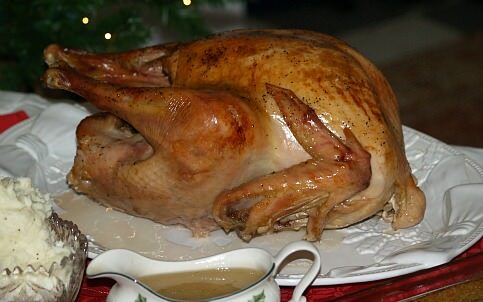 Turkey is a high protein food and can be used in a lot of heart healthy recipes. The turkey breast cooking time is quick and the white meat is very low in fat. 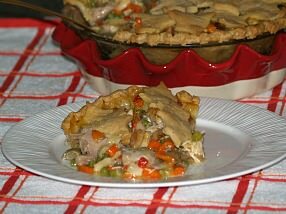 Turkey is also a wonderful chicken alternative and can be substituted in many of the chicken dishes. By adding a little chicken flavor and noodles, a wonderful German recipe is created. A large bird can be roasted and then used to make cheap meals in many leftover recipes. When you know how to cook a turkey add some with vegetables and create a Filipino recipe. The secret to cooking turkey burgers, which have become very popular, is not letting them get too dry. This can be accomplished by adding a little bread crumbs and milk to the fresh ground turkey. If you do not want the added calories from the crumbs just make sure not to cook them to long. The same Leftover Recipes can be made with cooked turkey as with cooked chicken; so try your favorite recipe using the turkey which is left. A turkey cooking chart is convenient to have at your access; it will guide you to serving the perfect turkey. Cooking Frozen Turkey is possible if I was not frozen with the giblets and neck stuffed inside. Turkey Cooking Time depends on the size of the turkey, if the turkey is frozen or thawed and if it is stuffed. Deep Fry Turkey has become so popular over recent years; the meat is succulent and flavorful and a favorite way of cooking for many. Try some creative turkey dinner recipes for cooking your turkey. Liven it up with some new and interesting flavors that your guests will love. After learning how o cook a turkey, you will want leftover turkey recipes. This is actually called “plantation shortcake”; resembling a pudding or puff. It is delicious served with hot turkey gravy. Add cornmeal to boiling water stirring constantly; add salt and cool. Combine and beat eggs in with milk; add to cooled cornmeal mixture. Add baking powder and melted butter; stir enough to blend. Add turkey to mixture; Bake in preheated oven at 375F degrees for 45 minutes. If you are learning how to cook a turkey, you also must learn a good recipe for cornbread dressing. There are a lot of delicious turkey dressing recipes but many prefer the cornbread ones. I love both! Place all crumbs in large pan in oven until a rich golden brown; stir often to brown all. Stir baking powder, salt and pepper into crumbs; add melted butter and stir until blended. Stir in hot water and stuff turkey; also good with other meats. TURKEY SALAD RECIPE This turkey salad recipe is a great way to use some of the meat when learning how to cook a turkey. Combine mayonnaise and whipped cream; stir in lemon juice and sugar to taste and set aside. Combine turkey, cheese, celery, almonds, salt and grapes; stir to blend. Add mayonnaise dressing (as desired) and toss to coat ingredients; serve immediately.